The Global Radar Systems Market is poised to grow strong during the forecast period 2017 to 2027. 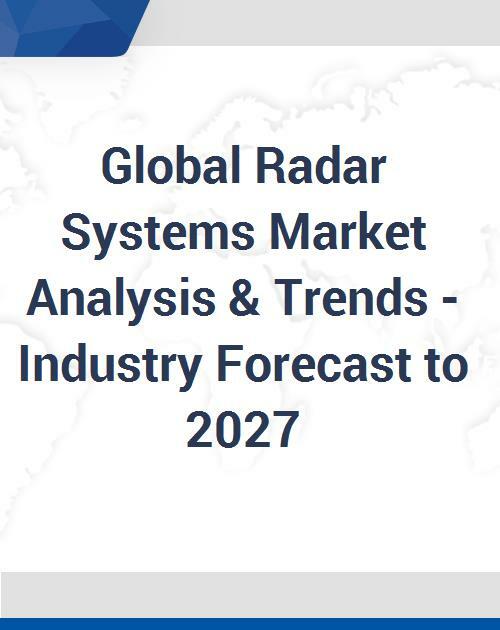 Some of the prominent trends that the market is witnessing include development of low-cost and miniaturized radars, increased demand for monitoring and cloud tracking for weather forecast and technological advancements in radar systems. By range, the market is divided into medium range radars, long range radars and short range radars. Depending on component, the market is classified into receiver, antenna and transmitter. Receiver segment is further sub-segmented into signal processor, mixer, display and low noise amplifier. Antenna segment is further classified into rotating conventional antennas, fixed electronically steered arrays and conformal integral with platform surface. Fixed Electronically Steered Arrays segment is further more segmented into passive arrays and active arrays. Transmitter segment further segregated into solid state using solid state devices and microwave tube based. On the basis of frequency band, the market is segmented into HF band, V/UHF band, L band, S band, C band, X band, K/KU/KA band and Mill metric band. By technology, the market is segregated into pulsated wave RADAR systems, continuous wave (CW) RADAR systems and other technologies. Based on end user, the market is divided into aviation, maritime applications, military & defense, space technology, weather monitoring, airborne, land-based, and naval and other end users. Other end users are further sub-divided into automotive and industrial. Note: Regional tables for North America, Europe, Asia Pacific, Middle East, Latin America, and Rest of the World (RoW) are presented in a similar manner as the above.